Adventure Palace may have a name which makes it seem like a game for the intrepid, but is actually a slot which will suit those players who like to keep things simple and familiar. 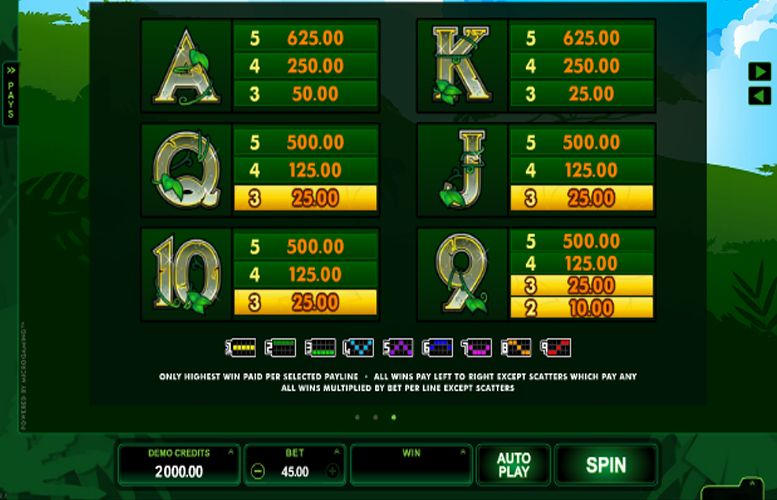 Set in a jungle, the slot has five reels, three rows and a maximum nine paylines. The game can be played with anywhere between just one and that maximum of nine paylines being active. 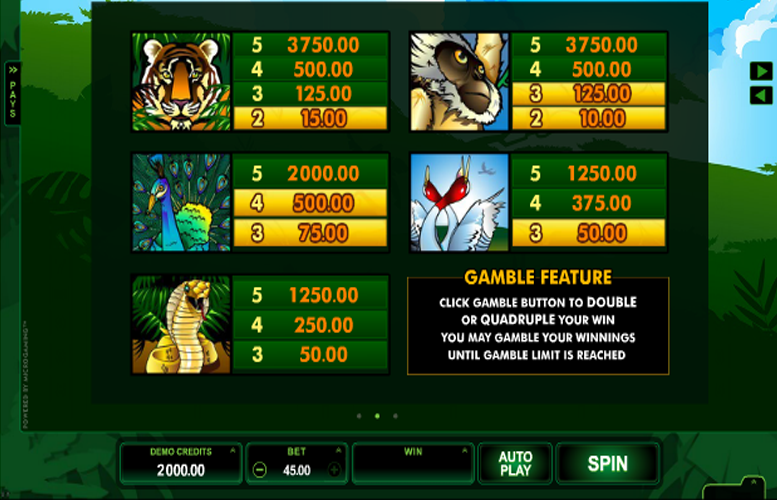 The slot’s reels feature a number of higher value animal symbols, as well as both a scatter and a wild. 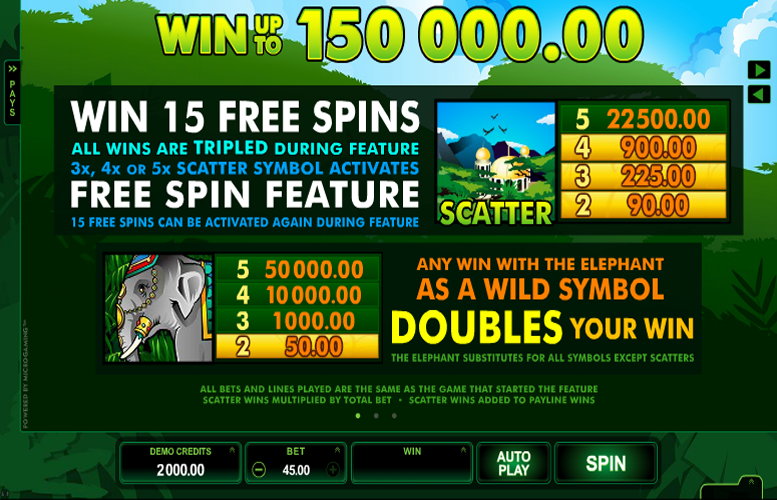 The scatters trigger free spins which boast a very nice 3x multiplier, and any win using a wild symbol is doubled. Away from those features, though, the game has no bonus round and few other additional gameplay elements. Free spins with a 3x multiplier can be triggered and give players a chance to significantly increase their winnings. The wild symbol not only substitutes for all other symbols (except the scatter) to improve your chances of making winning combinations, but also doubles any payline winnings. Players can alter the number of active paylines, number of coins bet per line and the value of those coins to get a good level of control over how much they bet per spin. The game is very simplistic. There is no bonus round or side game and the graphics are very straightforward, and a little old fashioned. Jackpots available during standard gameplay are perhaps a little disappointing, meaning that players must really rely on the free spins if they want to get a significant payout. A soundtrack involving background jungle noises starts to grate after not very long at all, but can fortunately be muted. However during bonus / free spin rounds a max win of 150,000 coins is available on the game – so that’s where the real money is. Adventure palace does not include a bonus round but there are a handful of ways that the slot provides additional winnings to players. Firstly, if a winning combination is made using one of the game’s elephant wild symbols, the combination will pay out at double the usual amount. Secondly, after every winning spin players have the chance to gamble and try to either double or quadruple their winnings. To double their winnings they must successfully guess the colour of a random face down playing card and to quadruple it they must guess its suit. If an Adventure Palace spin reveals three, four or five of the slot’s scatter symbol, a lucky player triggers 15 free spins. During those free spins, all wins are trebled and if three, four or five scatters are again revealed, a further 15 free spins are triggered. A good run during free spins, then, can lead to really impressive payouts. If they wish to alter the size of their bet per spin, Adventure Palace players can change the number of active paylines, the number of coins they bet per line and the value of each of those coins. Anywhere between one and nine paylines can be active per spin, one and five coins can be bet per line and each coin can be worth between a minimum of 1p and a maximum of £1. The minimum bet per spin, therefore, is just 1p and the maximum bet per spin is £45. 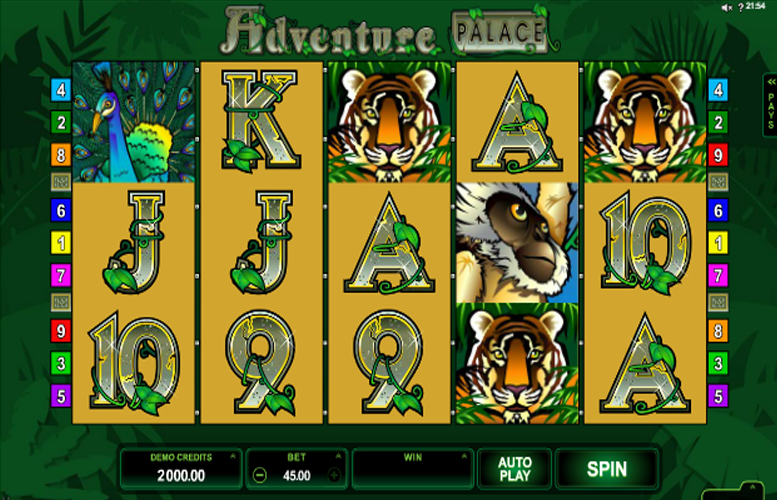 Whether you enjoy playing Adventure Palace or not will very much depend upon what you want from a slot game. If you are a fan of traditional slots with very few extra features and very simple gameplay, Adventure Palace will be right up your street. If you like your bonus games, attractive modern graphics and a little bit of plotting, then you may wish to look elsewhere. If you do decide to give Adventure Palace a go, you should find that you have good control over the amount you bet per spin and that you can sometimes achieve very nice payouts from very little outlay. The best of those payouts, however, are very much reserved for when you’re lucky enough to trigger free spins and their three times multiplier. This game has a rating of 5 / 5 with 346 total reviews by the users.